FairPlayoffs.com | Equalize the Michigan High School Playoffs! Proponents of maintaining status quo for the MHSAA playoff system, where private schools represent just 14% of all schools but win 30% of the state championships, often cite Michigan’s School of Choice law as a reason they believe the current playoff system is fair. However, a comprehensive look at the data debunks that assumption. In 1996, Governor Engler signed the first School of Choice law in Michigan. The law allowed students to move within their intermediate school district. In 1999, that law was expanded to allow students to move to districts outside their intermediate school district. In the year 2000, our baseline year for the Fair Playoffs initiative, 26,025 students were School of Choice students. In 2009, the number of School of Choice kids at neighborhood public schools or charter schools was over 240,000, by 2015 that number ballooned to over 275,000 students, 23% of all public school kids. However, as School of Choice has increased, private schools have begun winning a greater share of state championships. 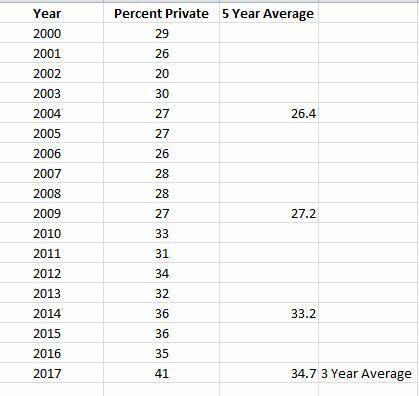 The lowest rate of championships won by private schools was 20% in 2002, while the highest rate was 41% in 2017, the last year that we have complete data. If we look at the 5 year trends since the year 2000, private schools won 26.4% of state titles, whereas in the most recent 5 year period private schools won 33.2% of state titles. While we cannot be sure about why private schools are winning more than double the number of titles they should be winning statistically, and while we don’t know why that number is accelerating, we do know that the current system is outdated. We have access to more information than ever. We are capable of using multiple variables to solve complex problems. Yet, the MHSAA continues to use just one variable, enrollment, to determine playoff groupings. While kids have School of Choice, school districts are stuck with the complacent Michigan High School Athletic Association, who has a monopoly on the high school playoffs in Michigan. It appears the only way to get the MHSAA to change, short of legislative action, is for a critical mass of school districts to pass the Fair Playoffs Resolution. On behalf of public school children, please ask your school board to support this resolution and send a copy to us and directly to the MHSAA. How States Institute Competitive Balance. Some states separate public and private schools for the playoffs. Virginia, Texas, New York, New Jersey, and Maryland all have some form of separate playoffs for public and private schools. Some states have a multiplier. Private schools, or other schools with similar advantages, have their enrollment number increased. This keeps public schools and private school playing each other, but most private schools, and potentially some public schools depending on the system, have to play in higher divisions. Arkansas (1.75), Georgia (1.5), Illinois (1.65), Missouri (1.35), and Ohio have multipliers for the playoffs. The number in the parenthesis represents the number that you multiply the school’s enrollment number by. Click on the state to learn more. At least one state, Indiana, reclassifies teams based on past tournament success. At least one state, Oregon, reduces enrollment by .25 for each student on free and reduced lunch..
Too often when we discuss why private schools are winning 2 to 3 times as many state titles as they should statistically, the debate becomes personal and people chime in with their anecdotal evidence. The most common complaint I hear from supporters of playoff fairness is that private schools recruit, and private school parenst can afford pricey summer camps and private lessons. The most common defense I hear from those who want to keep things status quo, often people association with private schools, is that this is just “sour grapes” and that teams that don’t win titles need to get better coaches and get their players to work harder. Those statements are often insulting depending on whose ears they fall on. In reality, there are a lot of reasons that this imbalance occurs. The “why” is disputable, the fact that an imbalance is occurring is not. Therefore, the “why” distracts us from the “what.” What are we going to do about this? Those of us that support a fair system need to spend our energy lobbying the MHSAA, member schools, informing the public, and encouraging the coaches association and other entities to join us on this journey. If you want to help, please approach your school board and ask them to sign the Fair Playoffs Resolution. Also, be sure to sign our online petition.